Everyone knows about Lower Bay, the lost subway platform down a set of closed-off stairs from Bay station, but that isn't the extent of Toronto's lost railway infrastructure. Over the last century or so, numerous passenger stations have been closed and, for the most part, erased from the landscape. Though each of the stations listed here closed for good reason (dwindling use, shifting rail priorities, etc.) it's interesting to speculate how useful they would be to today's commuter, especially with an eye to that holiest of transit grails, the Yonge Relief Line. Riverdale and Sunnyside's lost stations could have become useful stops on the Lakeshore GO line, if only the Grand Trunk Railway and later Canadian National Railway could have kept the doors open a little longer. Now that the city has grown up in size and population, it doesn't take a transit expert to see the possible value of rail stops at the Don River beside the West Don Lands developments, in Parkdale near Dufferin, or West Toronto in the Junction. 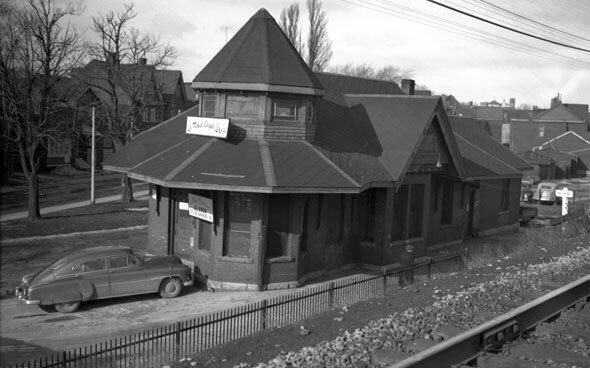 Here are five lost Toronto railway stations we wish still existed. Once located just south of King, Queen, and Roncesvalles, just east of where the pedestrian bridge crosses the rail corridor and the Gardiner, Sunnyside station was the stepping off point for hundreds of thousands of families excited to spend a day at Toronto's best-loved beach resort. The station buildings were located at street level and a set of stairs provided access to the platforms. The station was open from 1912 to 1972, when it was demolished. The amusement park was mostly torn down in 1955. Don station, which used to be near where Queen Street crossed the river, is still standing, albeit at Todmorden, some distance from actual working rail tracks. 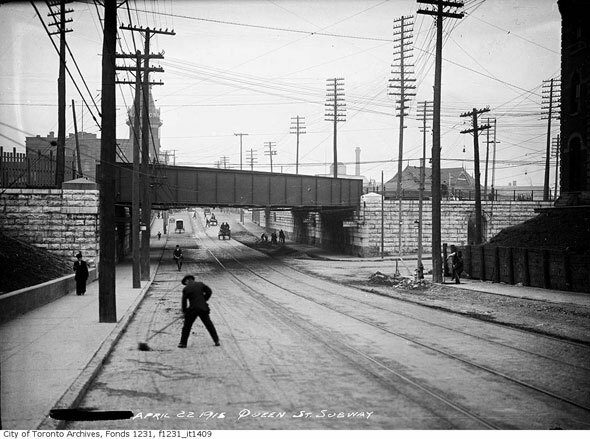 The station used to be on the west side of the Don, where Queen Street was carried over the water via a simple metal bridge. 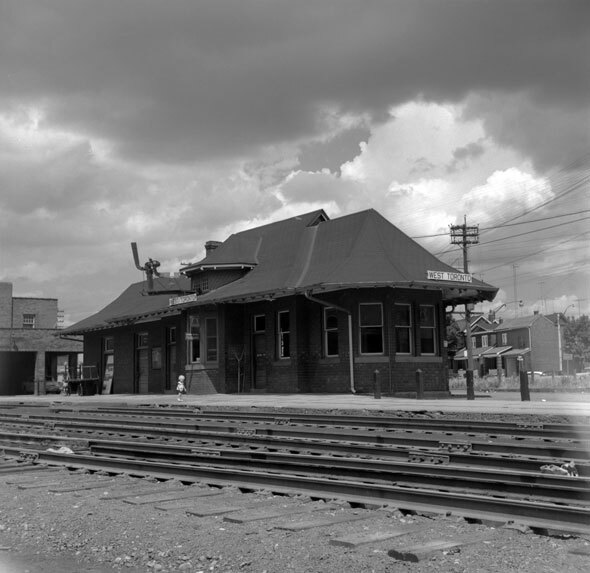 The station was at its peak in the 1920s, when practically all rail intercity services between Toronto, Ottawa, and Montreal stopped there. The station gradually declined in importance and was closed in 1967. It was moved to Todmorden in 1969 and is now at Roundhouse Park. 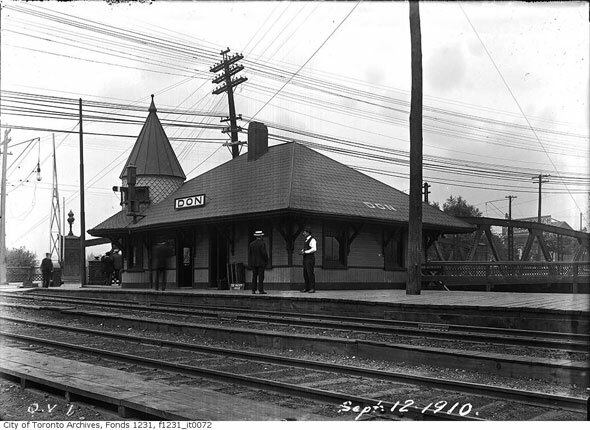 If West Toronto CP station still existed, it would be located just north of Dundas West and Dupont. 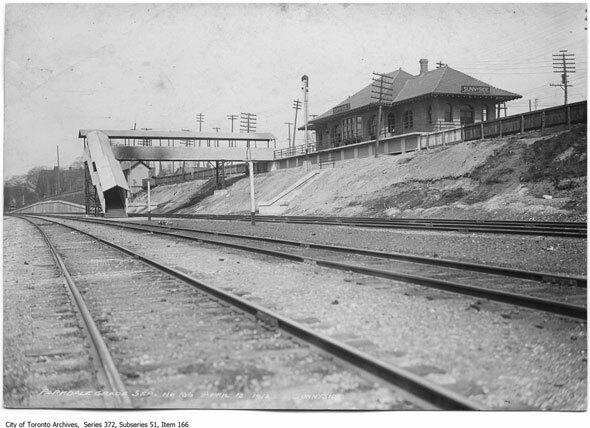 Clues to its former presence are still to be found: a barricaded and garbage-strewn staircase cut into the retaining wall of the railway overpass on Dupont was once a southern entrance to the station. The building clung on until 1982, when it was knocked down. In 2015, the Union-Pearson Express trains will zip past where the station used to be. On De Grassi Street, just north of Queen, there's a small park that marks the former location of Riverdale's lost railway station. The platform, ticket office, and waiting room, all located in a simple brick building with a large circular turret, was once perched on the steep side of the railway embankment, just where De Grassi straightens and heads north. A steady decline in passenger numbers during the Depression led to the closure of Riverdale station in 1932. The building, abandoned and forlorn, was demolished in 1972. The photo above was taken in 1952, when it was used as the headquarters for a carpet laying business.